Are you visiting Cambodia? Not sure what to expect? We’ve put together a list to help you prepare. Cambodia is in South East Asia. It shares borders with Vietnam in the east, Laos to the north and Thailand to the north and west. It’s scenic coastline to the south and west runs between Thailand and Vietnam. The capital, Phnom Penh, is in the central south of the country where the Tonle, Mekong and Bassac Rivers converge. It has an estimated population of about two million. Cambodia’s official language is Khmer. English is widely spoken in the bigger cities and tourist areas. Some people still speak French and those from border areas often speak some Thai. Increasing numbers of people in tourist areas are learning Thai, Chinese, Korean and German. The official currency is the riel. The unofficial currency is the US dollar. Most tourist places will quote prices in dollars. Foreigners withdrawing money from ATMs will usually be issued with dollars. However, there are no coins so any change less than $1 will be given in riel. Most people work on an exchange rate of 4000 riel to the dollar. Riel is handy for giving tips and buying small things like water and snacks. Tip: Don’t change money to riel. Bring American dollars with you or withdraw from ATMs. And it’s good to always have small notes with you. Tuk tuk drivers and some local restaurants and shops won’t always be able to give change for $10 or higher. ATMs are widely available in all of the major cities. As with any ATM withdrawal be wary of possible scams and don’t forget to notify your bank you will be travelling to Asia. We haven’t had any issues using ATMs in Cambodia. Credit cards are less widely used. All the big hotels and most of the big restaurants have credit card facilities. Some of the smaller guesthouses have credit card machines, but not all. Smaller restaurants and tourist operations don’t take credit cards so make sure you always have cash on you. Cambodia’s climate is tropical. It essentially has a wet season (June – November) and a dry season (November to May). What this basically means is the temperature is hot or hotter and goes from mildly humid to downright muggy. For those who come from humid countries, you will notice less humidity here in the dry season but those from cool climates will probably still find it hot, with temperatures reaching into the 30s most days. High season is in the slightly cooler dry season from November to February. 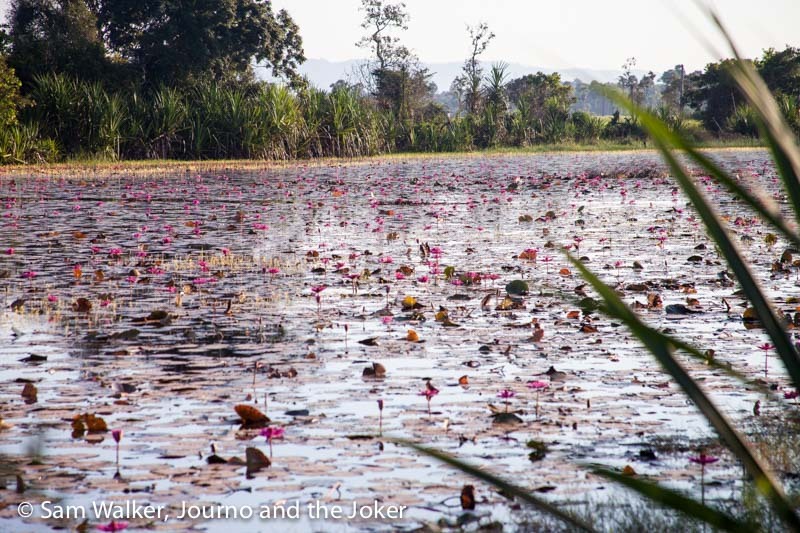 During this period the weather is likely to be less humid and night temperatures can drop on occasion to as low as 14 degrees (in Siem Reap) — although this only happened once or twice last year. Everything is dry, the rice has been harvested and red dust permeates the air. Personally my favourite time of year is wet season. Yes, there is a much higher chance you will encounter rain, and it can be torrential. It’s also going to be stinking hot and humid. But, there’s nothing quite like the lime green of lush rice paddies and buffalo wallowing in waterways. Wet season is when the country comes to life. The light is beautiful, the countryside is fresh and green and people are planting and harvesting. March to May is probably the worst time to visit. It is stinking hot and dusty, and even for those of us who love the heat, it can be oppressive. For most people it is possible to get a visa on arrival to Cambodia. The T visa (tourist visa) is good for one month. It is US$30. You can also apply online for an e-visa, which has an extra $7 charge. The Business visa or E Visa, is for long-term stays. It is also valid for one month on entry but you can go to most travel agents and apply for a one-month, three-month, six-month or 12-month extension. It is US$35 on entry. If applying for the visa on arrival, make sure you have a passport photo and American dollars to hand over. Some nationalities will need to get a visa prior to arriving so check with the Cambodian Embassy first. Visit this site for more information: www.evisa.gov.kh. 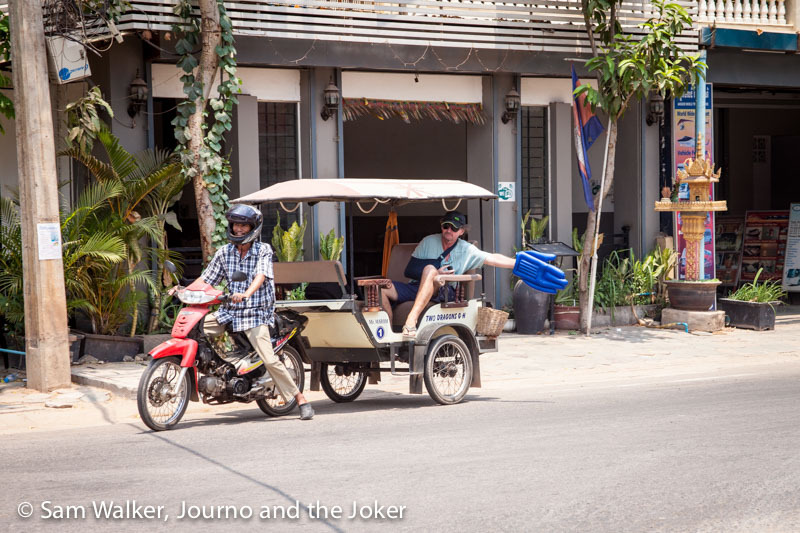 Tuk tuks are the standard form of transport in most towns and they are a fun way to get around. They are a pretty cheap form of transport but the drivers are often doing it tough. Check out our post on Cambodian tuk tuks for tips on hiring drivers. Buses and mini buses go between most towns and cities. You can also organise private taxis at relatively affordable rates, especially if you are sharing with others. For those who want to fast-track transport, flights are available between Siem Reap and Sihanoukville and Phnom Penh and Siem Reap. Free wifi is available at most places in all the big cities. Of course, the speed and reliability varies. But generally, we find it consistent and fast enough to do most of what we need. It’s certainly much better than we were getting in major cities in Australia. And most restaurants, guesthouses and even buses have a free wifi service. Cambodia is a conservative country and the women, in particular, dress modestly. Leave your low-cut shirts and skimpy shorts and skirts at home. If you are visiting any of the temples or pagodas you will need to cover your shoulders and your shorts and skirts should be at least to your knees. A scarf around your shoulders is not enough at many places. Likewise, you should dress modestly when visiting the villages, as a show of respect. Make sure you bring light-weight clothes because it’s hot. Most places you go you are required to take off your shoes, so we find thongs (flip flops) the most convenient shoes to wear. A good pair of runners might be an idea for a day traipsing around the temples. It is advisable to see a travel doctor prior to visiting Cambodia. You may require vaccinations and these can vary depending on your length of stay. Malaria is a problem in some parts of the country – particularly some rural areas and dengue fever is around, particularly in wet season so bring mosquito repellent and light clothing so you can cover up. Doctors also report seeing a number of people with sexually transmitted infections – so be sensible and safe. The roads are not the safest and the hospitals are not the best so make sure you have adequate travel insurance that will evacuate you to a first world hospital if necessary. Cambodia is a relatively safe country to travel in, but like anywhere it is advisable to be a bit street savvy and sensible. Scams exist (don’t they in most places?) and travellers can get a little bit lax in their behaviour. See our post on safety tips for travel in Cambodia for more details. Guesthouses and hotels are sprouting up like mushrooms. They range in price from the really cheap (a few dollars) to real luxury. You might find the bathrooms in the budget end places a bit squeezy and your level of service is likely to vary with the price you pay. For most people visiting Cambodia, the ancient temples of Angkor are the biggest attraction and are quite an amazing experience. But once you’ve seen the temples there’s plenty to keep you entertained. It’s well worth spending some time at Tonle Sap, a unique lake system — just be aware some parts are more touristy than others. 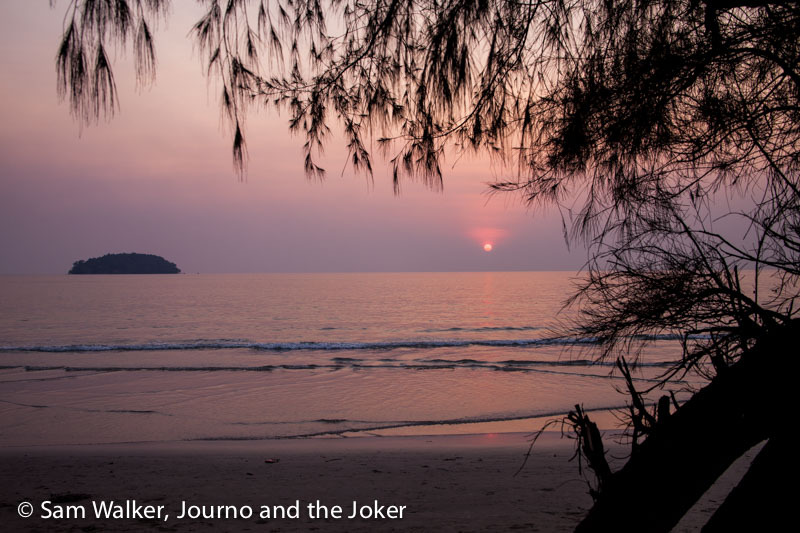 The beaches between Sihanoukville and Kep are beautiful and there are islands to explore off the coast. See a different side of the mighty Mekong River when you visit small towns like Kratie and see if you can spot the illusive and rare Irrawaddy dolphins. In the capital, the Killing Fields are sad, but a must-see, as well as visits to museums, pagodas and the King’s Palace. Several ethical elephant retreats can be found in the remote, eastern province of Mondilkiri along with forests and waterfalls. Battambang, the second-biggest city, and the country’s food bowl has stunning landscapes and interesting local industries. Wherever you go, make sure you tour through the countryside, visit some local villages and try the local food. You can shop at ethical fair trade shops for genuine handicrafts, try a cooking school, visit the circus, go snorkelling, diving or have some fun on quad bikes. There is something for everyone. 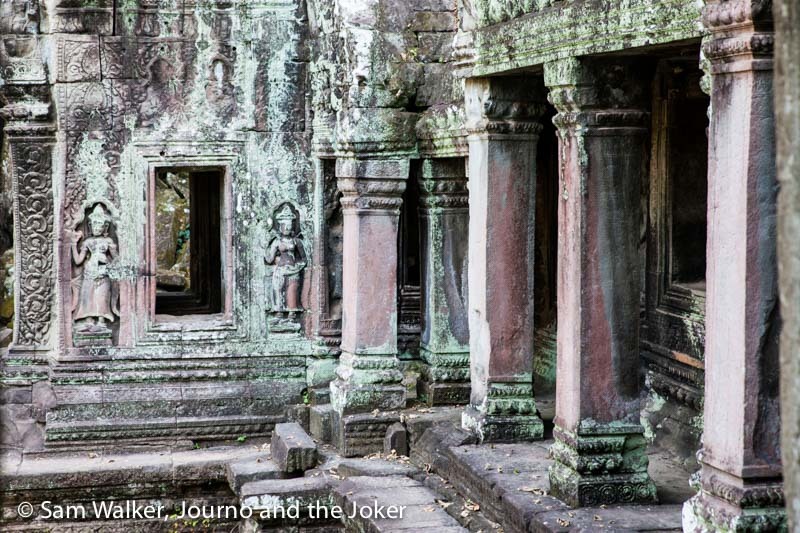 We hope these tips help if you plan on visiting Cambodia. Have you got any other questions or some of your own tips you’d like to share? Hi Petal, we certainly hope you make it here. It’s a magnificent country. Cambodia is on my bucket list , this article made even more interesting to visit Cambodia , thanks a lot ! Yes, it is cheap here compared to many western countries, although not as cheap as some of the neighbouring countries. It’s totally worth putting up with the tropical weather. Thank you Cheeta. We’re trying to make it informative and entertaining. Hopefully we are succeeding. I really hope you get to Cambodia one day. You will love the warmth and friendliness of the people. It is the thing that really draws people back time and time again.